Suzi Trubitz’s Serendipity Studio blooms in the desert hills of Santa Ynez, California. Climbing up the dusty drive, surrounded by ranch land and vineyards, you weave through jungle scenes transplanted from her last studio, complete with fuchsia, yellow, green and blue dancing ladies, gorillas, palm trees and mermaids who rock in the wind. At the top of the hill sits a sculpture of an altogether different aesthetic: a heart of sleek silver modern lines, created from two pieces of steel, a heavier base piece and lighter more mobile piece, welded to create a pulsing heart that also responds to wind with waves of sound. Trubitz smacks her outdoor creations fondly, and they sing and breathe in response. She mentions her scars and bruises; inevitable signs of the meeting of fragile human flesh with steel. She works with materials that are awkward in every way–heavy, larger than herself, sharp–and strives to reinvent them. Trubitz’s sculptural body of work includes works that are abstracts, cloths, letters, and figures. 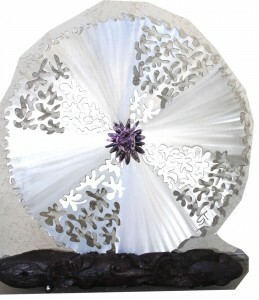 At the same time she has a series of multidimensional collages made of metal, glass, and mirror. Using the steel, stainless and bronze metal sheets as a canvas she cuts and scars buildings and figures, or working in layers she cuts complex patterns full of motion. From this cold medium she creates layers of leaves, lines of poetry, and streams of blossoms, then sets them over colored chards of glass and mirrors. Trubitz was born in New York and attended both Parsons School of Design and Boston University School of Fine Arts. She then worked on Madison Avenue and became an art director. Now settled in the hills of California, Trubitz finds herself inspired by more organic materials, such as wood in combination with other components. 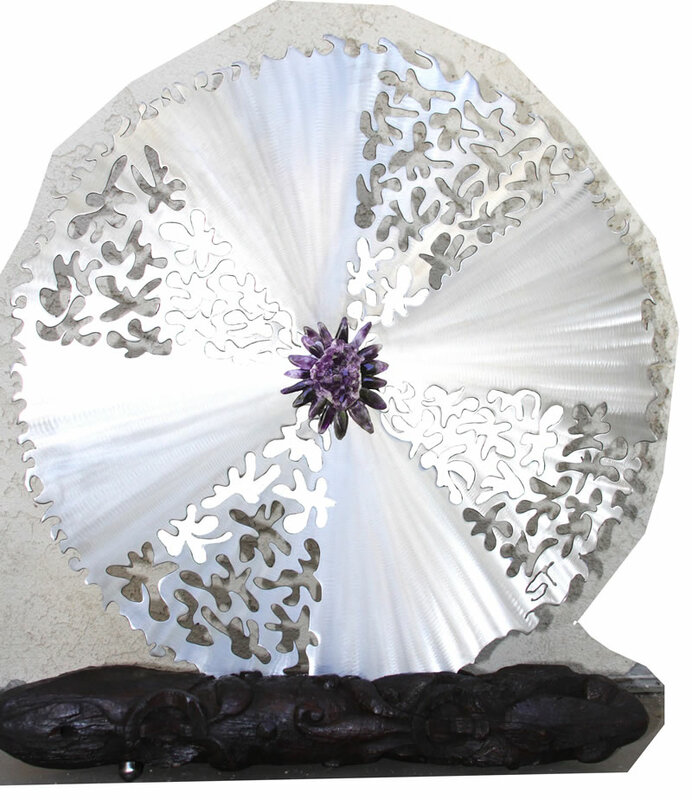 She enjoys the challenge of manipulating seemingly impossible materials into the intricate patterns of nature. The metal sheets that require operating welders, plasma torches, grinders and other shop equipment seem to energize her. The challenge also requires patience and restraint, for one cut through the metal could destroy a pattern that has taken weeks, even months to create. She explains, laughing, “ There are no mistakes in steel – no room for them—there is no eraser when you work with a flame.” Or in her case, creates a body of large sculptures that encompasses balance and sound, pattern and color, intimacy and intelligence.